Bucks UTC provided me with the professional environment I needed to grow in both my confidence, and technical skills, thanks to the help of industry-experienced staff such as Alan Bailey (Employer Engagement Lead). The UTC offers students the chance to take learning further than just obtaining a BTEC, by also allowing them to gain industry-recognised qualifications such as the Cisco CCNA. Notably, staff also helped me and my classmates in securing work placements, in order to experience what working in a real business is like. “Without the UTC, I would not be writing this knowing I have an apprenticeship lined up at my dream place of work!” – Sam Barrett. During my time at Bucks UTC I held three work-experience placements. The first of these was as a member of First-Line Tech Support at Bucks-based country house, Waddesdon Manor. This small team allowed me to work closely, and learn to communicate more effectively with users – such as taking complex technical issues, and providing simple explanations for individuals with no prior subject knowledge. My second placement was at Cisco UKI, a multinational company specialising in network and internet-based equipment and services. I worked within one of their Research and Development teams, which allowed me to move away from Tech Support and to start to understand how engineers build and test new products, before they are released to customers. My time at Cisco was also my longest running, lasting over 8 months (1-2 days a week) and gave me a genuine, ‘dream prospect’ that I could be working for Cisco one day. My most recent role through Bucks UTC was with Rackspace, who are leading Cloud-Management Experts. This gave me a chance to learn more about dedicated cloud hosting, and how to communicate with and support customers in a professional capacity. This directly led to an interview for me and two other Bucks UTC students, for a full-time position at Rackspace. 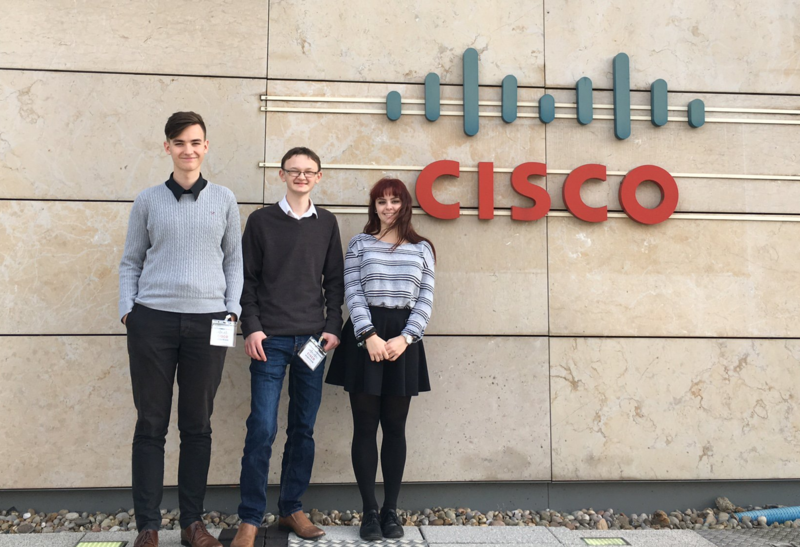 Sam Barrett along with two classmates at Cisco HQ, for the Research & Development Work-Experience Placement. After my time at Bucks UTC, there was a range of opportunities available. In addition to interviewing for a full-time position at Rackspace, I was offered a place on a Computer Systems and Networks course at Plymouth University, and I got my second-choice offer of Computer Security at Birmingham City University. However, I ended up interviewing for a place on the Cisco Systems UKI Degree Apprenticeship Programme, and got offered the place! As of July 31st 2017, I will be a Degree Apprentice at Cisco Systems UKI. As you can see, Bucks UTC allowed me to have many extra options, in terms of both work experience and further-education opportunities. Without the UTC, I would not be writing this knowing I have an apprenticeship lined up at my dream place of work! If you would like to contact me about my line of work, please email me at sambarrett23072@gmail.com. And if you would like to keep up with where my career has led, please connect with me on LinkedIn. 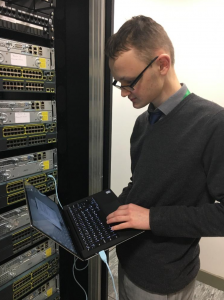 Bucks UTC student Sam Barrett, working in the Demo-Server Room. If you’ve been inspired by Sam’s story and would like to learn more about the opportunities that lie ahead for our Sixth Form students, take a look at our new Post-16 Curriculum Offer for 2017-18. We’ve now got even more work placements, industry-recognised qualifications, and A Levels to offer, than ever before.